BACKGROUND: Complexities generally are conundrums that inhibit efficiency and effectiveness in research and practice; one of the symptoms of this is nebulous obstruction to task completion in the workplace. Complexities in work procedures create complications in the application of procedures for completing tasks. Recent trends in the Auditor General's report have demonstrated the metastasising culture of non-compliance to work procedures in municipalities in South Africa. Research, as well as the audit outcomes for the Eastern Cape in particular, is a testament to this assertion. Therefore, there is no need to make work more complex. Today's newspapers, magazines and articles show particular concern with non-compliance in work procedures that improve the performance of government functionality in South Africa as alluded to by the Auditor General South Africa (AGSA) reports 2010-2015. This assertion is reinforced by Scheepers (2012): '… negligence is a failure to comply with the standard of care that would be exercised in circumstances by a reasonable person'. The implication of Scheepers's assertion can be summarised as the effect of non-compliance on organisational success, in that non-compliance impacts negatively on staff performance, increases government wastage and results in suffering of the community and consequences that go far beyond the penalties and fines assigned to the individual or the department. Taylor's famous dictum is thus useful here: '… in the past, man has been first, in the future the System will be first' (Kanigel 1997; Rastegar 2004:78); this stresses the need for systems to operate optimally over individuals. Therefore, compliance is not mere rhetoric or mere formalities; rather, it is an avenue to rid a system of controversies and uncertainties and to improve a system rather than improving an individual. All work is structured, tailored to a certain goal. Hence, the work structure of an organisation determines what the organisation intends to achieve and the means through which such is achieved. In other words, it determines the vision of the organisation and the mission through which such visions are achieved. Therefore, there is a need to take cognisance of the structure of an organisation, because the structure determines to some or a large extent the procedures in the fulfilment of organisational tasks. Therefore, according to Allen (n.d.), work structure is a step-by-step method that identifies dysfunctional aspects of workflow, procedures and systems, and realigns them to fit current realities to realise the goals of the organisation. The focal point of work structure is to improve both the technical side and compassionate side of the organisation (Prabhu 2010). However, Connor (n.d.) argues that work structure must not be merely limited to mapping out an organisation's total structure. Like Prabhu (2010), Connor argues that other aspects, such as functions, processes and strategies, as well as how these strategies, functions and processes are coordinated and harmonised, are necessary to achieve the overall objective of the organisation (Connor n.d.:1). Work structure or design in the mechanistic realm is characterised by job functions which are 'broken-down into specialist tasks that were "precisely defined"' (Burns 1963:103; Connor n.d.:5). This model adopts the form of 'rigidity' because of the relatively stable business environment conditions in which it functions (Shafritz et al. 2011). Its major attributes include high rigidity, high levels of formalisation, low adaptive capabilities, high centralisation, high stratification, low complexity, high productivity and efficiency and low job satisfaction (Lunenburg 2012:4). See Figure 1 for more clarification of work procedure design. In 1911 Taylor published his book on The principles of scientific management, in which he spelt out the process of scientifically studying work to improve workers' efficiency (Shafritz et al. 2015:68). The fundamental principle underlying Taylor's theory shaped the notion of organisational performance, organisational compliance and efficiency theory in the 20th century and beyond. Taylor's notion of work dealt significantly with, '… task specialization, assembly line production practices, job analysis, work design, incentive schemes, person-job fit, and production quotas and control' (Giannantonio & Hurley-Hanson 2011:7; Rahman 2012:33). 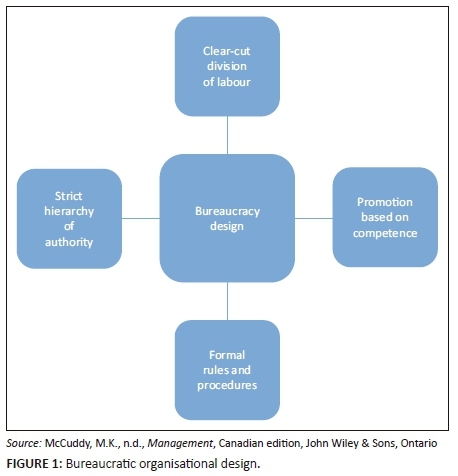 Taylor's argument was that work procedures should be characterised by job functions, which are 'broken-down into specialist tasks that were "precisely defined"' (Ndaguba 2014). There was a clear separation from employee to final completion of a product in that every employee was meant to focus on a little aspect of the production line (Eyre 2015), thereby gaining expertise as a result of routinisation of functions and tasks. Of note was that employees' performance was measured based on the number of tasks successfully completed (this notion has some similarities with the balance scorecard in monitoring and evaluation). However, employees completed their tasks with little or no knowledge as to the overall output of the product (Connor n.d.:5; Ndaguba 2014). This was one of the pitfalls of Taylorism, along with the notion that it sees employees as a cog in the wheel. However, one of the essential features of Taylorism is the close supervision of junior employees in task completion and, more so, the idea that only those who understand certain functions are meant to occupy such positions (square peg in square hole) (Burns 1963:103). Taylorism has four underpinning principles, namely: to find the one 'best way' to perform each task, to carefully match each worker to each task, to closely supervise workers, and use reward and punishment as motivators, and finally to manage, plan and control (Walonick 1993). The most popular classification of research methods is qualitative and quantitative. At one level, qualitative and quantitative may refer to distinctions between the nature of knowledge and the researcher's world view or the ultimate aim of the research. On another level, the terms refer to the way in which data are collected and analysed, and the type of generalisations and representations derived from such data (Brysman & Burgess 1999:45). This study adopts a quantitative technique for gathering data. It uses a survey questionnaire while using cross-tabulation and regression to determine the strength of the relationship between variables. This article used a descriptive research design. 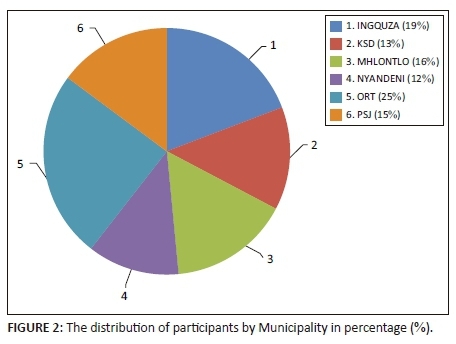 A quantitative empirical research approach was adopted, distributing self-administered questionnaires with the assistance of 12 students in all 5 local municipalities (King Sabata Dalindyebo, Nyandeni, Ngquza Hill, Port St John's and Mhlontlo local municipality) and the district municipalities in 2014. Over 1200 questionnaires were distributed and 754 were returned. From this 754, 593 were correctly completed by junior employees. In selecting the respondents for this study, the purposive sampling method was utilised for the simple fact that we needed junior employees. In this article, the Likert scale developed by Rensis Likert (1932) was favoured as the instrument for data collection. This instrument gives a wide range of answers to the respondent, in other to have a fair view as to how work is carried out in the municipality. The Likert scale gives range of choices of level of agreement with each option: 'every time' (100%), 'frequently' (70% - 90%), 'sometimes' (50% - 60%), 'rarely'(10% - 30%) and 'never'. There are no right or wrong answers, since the idea is to procure the perceptions of the employees. There are five categories for rating the application and utilisation of work procedure for performance enhancement which includes: (1) Never (2) Rarely (10% - 30%); (3) Sometimes (31% - 60%); (4) Frequently (61% - 90%); (5) Every time (91% - 100%); (6) NA. Figure 3 demonstrates that about 22% of the respondents agreed that they comply to acceptable standards for completing task in the municipalities. In addition, 33% and 27% responded that they comply almost every time and occasionally. The study invariably shows that a total of 81% (which is a combination of 'every time', 'almost every time' and 'occasionally') of respondents uses acceptable procedure documents for completing municipal functions in order to ensure efficiency and productivity. Productivity is seen by the Encyclopedia of management (Crown Online 2015), as the overall measure of the ability to produce a service or goods in relation to an outcome. More specifically, productivity is the measure of how resources of organisations are managed to accomplish the objectives of a task in a timely manner (see figure 4 for compliance). 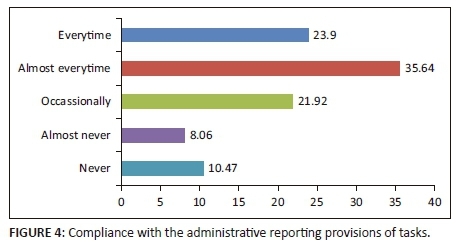 Figure 4 shows that about 24%, 36% and 22% (representing 'every time', 'almost every time' and 'occasionally') comply with administrative provisions for municipal reporting as contained in several municipal guidelines, such as Municipal Strategic Self-Assessment (MuSSA) reports and Local Government Management Improvement Model (LGMIM). This infrequent use of work procedures in the municipalities explains the lack of productivity: with a paltry 24% using procedures to reduce friction and risk, one cannot wonder at the decay of service delivery and the failure of compliance of the financial statements of the municipalities (see AGSA reports 2011-2015, strike actions with regard to service delivery in the municipalities). However, while in Figure 3 22% of participants meet the acceptable standard for completing a task, in Figure 4 where the utilisation of work procedures is analysed, 24% suddenly comply. This shows some discrepancies as to whether the employees of the municipalities are really aware of what constitutes proper work procedure, despite the two-day workshop offered to orientate the municipalities to the need for the use of work procedure and the importance of work procedure design for workplace improvement in municipalities. The importance of adherence to work procedure cannot be over emphasised. As Osterberg (2005:487-497) and Goldberg et al. (2009:39) argued, the full benefit of a medication is achieved when a patient follows the prescribed regimen reasonably closely. As in the field of medicine, in most disciplines in the sciences there exists one best way of carrying out a procedure (hence Taylor's assertion); thus in this study we believed that in order for adherence to be achieved in the municipalities, there must exist one best way to complete a task, but not limited to the tenets of scientific management. Hence, there is a need to develop work procedure through consultation with staff, community workers, community organisations and non-governmental organisations (NGOs) in the communities in order to create the ideal municipality. The central piece of Taylorism is not just the establishment of one best way that reduces friction and chaos in organisations, while eliminating waste, undesired motion (processes) and time, which could result in saved costs and increased efficiency and productivity in the public service in South Africa (Locke 1982:15), but also setting a baseline for future engagements and the ability of public servants to be responsible for their actions (see figure 5). Figure 5 shows that only 9.76% have never used established work procedures in completing their tasks. 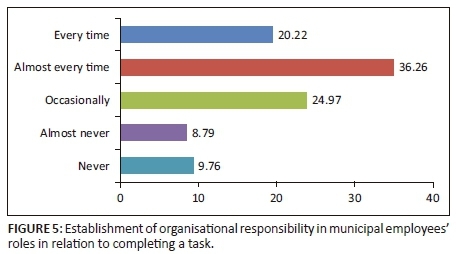 In contrast, 20.22% of the participants are certain that in completing every task (this is still in sync with the assertion of Figure 3), they adhere strictly to procedures that describe the role they play in achieving the overall functionality of the municipalities. Meanwhile, 61.23% (consisting of 'almost every time' and 'occasionally') state that they use work procedure in the establishment of roles and in discharging their functions. This implies that most of the employees (junior) have a specific role. This is unarguably one of the resounding advocacies of Taylorism when he opined that each worker must be assigned a specific task (role) of a certain quality. This is reinforced by the work of Adam Smith on 'An inquiry into the nature and causes of the wealth of nations', where he opines that 'division of labour leads to specialization' (Adam Smith 1776). Gilbreth and Carey (1948), in the time and motion study Cheaper by the dozens, argue that the responsibilities and remote task of employees lead to the general organisational success in any sector (Gilbreth & Carey 1948; Smith 1776). But where the lines of communication is compromised, much is left unanswered (see figure 6). Thus Figure 6 shows that 23.38% of the participants adhere strictly to established communication lines in the municipalities. Meanwhile 36% of the participants argue that they use the established lines of communication 'almost every time'. 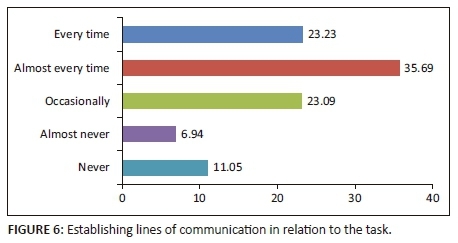 23.09% and 6.94% of the participants use established communication lines 'occasionally' and 'almost never'. A paltry 11.05% of the participant argue that they have never utilised the established lines of communication by the municipality in the performance of their duties in the public service. Although 11.05% might seem miniature, it could be the reason why the AGSA has always insisted that the municipalities have not met the mandatory standards for reporting (AGSA 2014). Also, and more importantly, if they have not been using the established means of communication, or not using them every time, what do they use? This is important and calls for further probing; hence, it will be wise to learn whether the means of communication used by other workers are more or less effective than the established lines of communication. Figure 7 shows that 23%, 36% and 20% of participants (representing 'every time', 'almost every time' and 'occasionally') adhere to established legislative procedures to a high degree. However, 10.28% participants have never complied with established legislative provisions in completing their tasks. Legislative frameworks as exemplified in the Municipal Finance Management Act (Republic of South Africa 2007) speak to proper financial management and performance management, transparency, accountability, stewardship and good governance; the Employment Equity Act explains how recruitment occurs. Therefore, the limited number of those utilising this legislative framework could be one of the reasons why most of these municipalities have not been able to clinch a clean audit outcome from the AGSA report since 2011 and the reason for several interventions and multiple strike actions in 2014. It is important to note that to have an operational government at all levels, work procedures following legislation on finance and human resources must be taken seriously as they guide the way the budgets are formulated and presented, and stipulate clearly what the municipalities must strive to achieve, primarily in line with the procedural requirement of each municipality (see Figure 8). For every task that is broken down there must be a procedure geared to fulfilling or performing or completing the task with less effort and fewer resources (Taylor 1911). Taylorism is mainly about 'task specificity', ensuring that a task assigned to an employee is specific, and that the employee is trained to meet the requirements (see capability management) for fulfilling the task, is seen as one of its four principles (Taylor 1911). Figure 8 agrees totally that compliance with procedural requirements in fulfilling a task saves time and cost, with 23.47% of respondents saying that they comply every time with procedural requirements when doing their work. Meanwhile 36.13% and 20.63% confirm that they comply with procedural requirements in the completion of their tasks, but only to a certain degree. It is therefore important to understand what compliance with work procedures does to organisational efficiency: when compliance increases in a sector, does performance also increase or vice versa? In order to demonstrate whether or not compliance is an issue for municipalities, the presence or absence of a relationship needs to be established. The study suggests that management of these municipalities must develop the 'one best way', which should be revisited frequently to ensure that functions are tied to the objectives of the municipality.